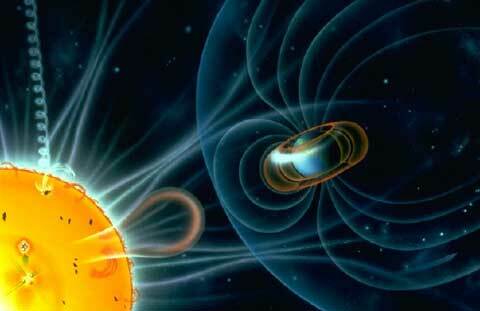 Scientific opinion is divided on what causes geomagnetic reversals. Many scientists believe that reversals are an inherent aspect of the ‘dynamo theory’ of how the geomagnetic field is generated. In computer simulations, it is observed that magnetic field lines can sometimes become tangled and disorganized through the chaotic motions of liquid metal in the Earth\\'s core. In some simulations, this leads to an instability in which the magnetic field spontaneously flips over into the opposite orientation. This scenario is supported by observations of the magnetosphere, which undergoes spontaneous reversals approximately every 11 years. However, with the Sun it is observed that the solar magnetic intensity grea! tly “increases” during a reversal, whereas all reversals on Earth seem to occur during periods of “decreased” field strength. There have been more recent additions to the understanding of pole reversals, such as that of Dr. Peter Olson, geophysicists from Johns Hopkins University. Dr. Olson believes in part, geomagnetic reversals are not spontaneous processes but rather triggered by external events such as increased solar activity which could have a chain reaction to the flow in the Earth\\'s core. Such a process may include the arrival of continental slabs carried down into the mantle by the action of plate tectonics at subduction zones. Also the initiation of new mantle plume’s from the core-mantle boundary, and possibly mantle-core shear forces resulting from very large impact events. It is my extrapolated opinion to suggest pre-cursors to a full magnetic pole shift will include an escalation of severe weather storms (water and wind), an increase in number and size of earthquakes (dirt), and an increase in volcanic eruptions (fire). Dr. Olson has now provided evidence which suggest the magnetic pole reversal is well underway. His research indicates a rapid decrease of the “dipole moment”. The geomagnetic dipole moment has decreased by nearly 6% per century since first measured by Gauss in the 1840s. This is 10-20 times faster than the Ohmic decay rate of the fundamental mode dipole field in the core. The causes of this rapid decrease are the proliferation of reverse magnetic field on the core-mantle boundary, especially beneath the South Atlantic, better known as the “South Atlantic Anomaly”. Also evidenced is the advection of magnetic field from high to low latitudes by flow in the outer core. The combination of advection of magnetic field on the core-mantle boundary and radial diffusion through the core-mantle boundary is weakening the dipole moment. At present, the overall geomagnetic field is becoming weaker at a rate which would, if it continues, cause the field to disappear, albeit temporarily, by about 4000 AD. Other sources have put the date of field collapse as early as 3000 AD. The strong deterioration began at least 150 years ago and has accelerated in the past several years; however, it should be noted that the geomagnetic intensity has declined almost continuously from a maximum achieved approximately 2000 years ago. So far the strength of the Earth\\'s field has decreased by 10 to 15 percent over the last 150 years, and approximately 35% over the last 2000 years. We certainly do live in “interesting times”. Perhaps as our Hopi Elders tells us “We are in the great purification. Our system of life will end…as we know it”. I do not view this as doom and gloom, but as a renewal. Yes people will die; it is the cycle of life. But we will all have an opportunity to change (evolve). Yes, this is where it surely can become metaphysical and rightly so. Science is a great teacher. It has provided us with miracle results. But it is our older science that has the last word. The science of ancient wisdom, rituals, rights of passage, story telling, and community. A time of communion with our higher self’s, Great Spirit, Creator….GOD. One might say this is the ultimate science of the “Alpha-Omega” of life.